Joseph, the husband of Mary, is a good model for us in handling crisis situations. When he found that his betrothed wife was pregnant, and when her justification was not convincing to him, he took a non-judgmental approach to Mary. As a righteous man, he did not want to put Mary in shame or subject her to punishment. While Joseph was considering to divorce Mary in private, God interfered through a dream to him. It is similar to God’s interference in the life of Abraham when he was close to sacrifice his son Isaac. Patience of Joseph allowed him to experience the timely intervention of God to resolve the issue and to take up the noble and hard responsibility as head of the Holy Family. Joseph was a quiet and active servant of God. His model of service to Jesus and Mary, based on his trust in the Lord, is a model for our Christian life. (18) Now this is how the birth of Jesus Christ came about. When his mother Mary was betrothed to Joseph, but before they lived together, she was found with child through the holy Spirit. (19) Joseph her husband, since he was a righteous man, yet unwilling to expose her to shame, decided to divorce her quietly. (20) Such was his intention when, behold, the angel of the Lord appeared to him in a dream and said, “Joseph, son of David, do not be afraid to take Mary your wife into your home. For it is through the holy Spirit that this child has been conceived in her. (21) She will bear a son and you are to name him Jesus, because he will save his people from their sins.” (22) All this took place to fulfill what the Lord had said through the prophet: (23) “Behold, the virgin shall be with child and bear a son, and they shall name him Emmanuel,” which means “God is with us.” (24) When Joseph awoke, he did as the angel of the Lord had commanded him and took his wife into his home. (18) Now this is how the birth of Jesus Christ came about. When his mother Mary was betrothed to Joseph, but before they lived together, she was found with child through the holy Spirit. According to the Jewish custom, betrothal was the first part of the marriage when bridegroom and bride made an agreement that was binding. Both of them were known as husband and wife. However, they could not live together like married couples until their official wedding would take place a year after. Any infidelity in between betrothal and wedding was considered adultery and was subject to severe punishment. (19) Joseph her husband, since he was a righteous man, yet unwilling to expose her to shame, decided to divorce her quietly. Joseph was considered as a righteous man because he was a devout observer of the Mosaic law. He had to do justice to himself and to Mary. His dilemma was that he was uncertain of what was the truth. Joseph suspected Mary’s credibility and believed that she had violated the law and got pregnant from somebody after her betrothal with him. Since betrothal had legal validity, he had to divorce her to free himself from his legal bond with her. Joseph had no evidence to prove Mary’s innocence or guilt. The law stated thus: “If there is a young woman, a virgin who is betrothed, and a man comes upon her in the city and lies with her, you shall bring them both out to the gate of the city and there stone them to death: the young woman because she did not cry out though she was in the city, and the man because he violated his neighbor’s wife. Thus shall you purge the evil from your midst.” (Deut. 22:23-24). In Mary’s case, this was not the situation. There was no first hand evidence to prove Mary’s guilt and no man was found guilty of abusing her. Joseph found it hard to believe Mary because pregnancy cannot happen without sexual union of two people. Probably Joseph knew the prophecy in Isaiah 7:14: “Therefore the Lord himself will give you a sign: The virgin will conceive and give birth to a son, and will call him Emmanuel.” But Joseph could not believe that it would happen to his wife. If Joseph would accuse Mary of committing adultery, she would be exposed to shame and even be stoned to death based on her pregnancy out of wedlock. In case Mary was telling the truth, Joseph would be responsible for hurting an innocent person. So the only option for him was to divorce Mary privately by writing a bill of divorce (Deut. 24:1). However, he did not take this action immediately; but was only considering it. The name Joseph reminds us of the Joseph of the Old Testament. He was also a chaste and righteous man. The moral integrity of Joseph is presented in Genesis chapter 39 where he overcame sexual temptation from Potiphar’s wife even though he knew that she would give him hardship for not yielding to her. Joseph of the Old Testament could take revenge on his brothers or at least put them to public shame when they came in front of him in Egypt searching for food. Instead, he treated them well and told them, ‘You intended to harm me, but God intended it for good to accomplish what is now being done, the saving of many lives. So then, don't be afraid. I will provide for you and your children.’ And he reassured them and spoke kindly to them.” (Genesis 50: 20-21). Joseph in the New Testament is also a favorite son of God the Father who inherited the holiness and righteousness of his forefathers, especially Joseph of the Old Testament. (20) Such was his intention when, behold, the angel of the Lord appeared to him in a dream and said, “Joseph, son of David, do not be afraid to take Mary your wife into your home. For it is through the Holy Spirit that this child has been conceived in her. The appearance of Angel Gabriel to Zechariah and Mary were in visions. But for Joseph, the message of the angel came in a dream. Biblical concept of vision and dream are different. Vision occurs when one is awake, while dream happens when the person is asleep. Some studies show that people always dream when they sleep. But people remember only the dream they have right before they wake up or the dream that makes them wake up. The dream of Joseph was so real and touching that he woke up and considered it as a divine message for him. Bible gives importance to dreams and interpretation of dreams. Dreams were used for various purposes. Some times God used dreams to reveal prophecy. Like Joseph, the husband of Mary, Joseph of the Old Testament was also a dreamer. He was also gifted with interpretation of dreams. His dream of his brothers bowing down to him came true. His interpretation of Pharaoh’s dream saved Egypt and his family from seven years of famine. The dream of the Babylonian king Nebuchadnezzar and its interpretation by Prophet Daniel came true in the history. Gideon was encouraged for winning the war in a dream. (Judges 7:5). Dreams were also used in the Bible to give warning from dangers. The Magi did not return to King Herod because God warned them in a dream. (Matthew 2:12). God warned Joseph in a dream to flee to Egypt for saving the life of Infant Jesus. (Matthew 2:13). Another message through dream of Joseph brought the Holy Family back to Nazareth. (Matthew 2:19-22). These dreams were special and different from ordinary dreams. The name of the angel is not specified in Joseph’s dreams. Angel of the Lord in the Old Testament is often a representative of God or God Himself to communicate with a human being. Some examples of the Angel of the Lord’s appearance are to Hagar (Gen. 16:7-14), to Abraham and Sarah at Mamre (Gen. 18:1), to Abraham on Mount Moriah (Gen. 22:11-12, 22:15), to Jacob (Gen. 31:11, 32:25), to Moses (Exodus 3:2), to Joshua (Joshua 5:13-15), to Gideon (Judges 6:22), and to Samson’s parents (Judges 13:21-22). The salutation of Joseph by the angel was attention getting: “Joseph, son of David.” Joseph was not a direct son of King David. Angel acknowledged that Joseph was from the lineage of King David. Angel prepared Joseph for the next part of the message that the angel was going to convey. Israelites were expecting a Messiah who would be a descendant of King David because of God’s covenant with him (2 Samuel 7:12-16). So Joseph also had a share in the genealogy of the Messiah as his legal father. “Son of David” was used for Jesus several times by people who were seeking his mercy. For example, a Canaanite woman called Jesus, “Lord, Son of David” while asking him to cure her daughter who was tormented by a demon. (Matthew 15:22). Two blind men requesting healing from Jesus also called him, “Lord, Son of David.” (Matthew 20:30). In these cases, they were acknowledging Jesus as their savior using the term Lord and the Messianic title “Son of David.” The usage of “son of David” by the angel to Joseph is not the messianic title but only meant that God sees his ancestral connection with David, from whose line the deliverer would come. There is difference in the use by “son” by translators: “S” is capital when “Son of David” is used for Jesus and “s” is small letter when it is used for Joseph. Some fathers of the church like Sts. Thomas Aquinas, Bernard, Basil and Ephraim interpret that Joseph was thinking of divorcing Mary out of “reverential fear.” Mary had told Joseph of her vision and the message of Angel Gabriel and what had happened afterwards. Joseph trusted the narration of Mary and felt himself unworthy to be the husband of Mary and foster father of her divine son. So Angel of the Lord is assuring Joseph not to be afraid to take Mary as his wife. According to the Jewish custom of marriage, the final stage of wedding was when the bridegroom, who was also called husband, would come to bride’s home and take her to his home. So the angel was assuring Joseph that he could trust Mary and take her home as his wife. Work of the Holy Spirit is specified in the creation account in the book of Genesis. “Now the earth was formless and empty, darkness was over the surface of the deep, and the Spirit of God was hovering over the waters.” (Genesis 1:2). Psalm 104:30 says: “When you send your Spirit, they are created, and you renew the face of the ground.” God created everything with his Word (Jesus) and his Breath (Spirit). (Psalm 33:6). Angel informed Joseph that the same Spirit that created the world and the humans, had come upon Mary in a special way. So Jesus was of divine origin while Mary remained virgin. Angel Gabriel told Zachariah: “Your wife Elizabeth will bear you a son.” (Luke 1:13). This was different from what the Angel of the Lord said to Joseph: “She will bear a son” implying that this son was not from his sexual relation with Mary. So Joseph was not supposed to consummate his marriage with Mary. The angel gave both Mary (Luke 1:31) and Joseph (Matthew 1:21) the right to name the child Jesus. However, it was Joseph who named Jesus as instructed by the angel. (Matthew 1:25). Thus Joseph acknowledged himself as the legal father, though not the biological father. According to the concept of the time, to name a child was to claim the child as one’s own. Jesus’ fatherhood belongs to God the Father who assigned the name Jesus for his son and asked his foster father Joseph and mother Mary to use that name at the time of his circumcision. Matthew was here referring to Isaiah the prophet in 7:14. “The virgin” (not “a virgin”) stands for a particular virgin that God had selected for this role. And that chosen virgin was Mary. Though Prophet Isaiah said in 7:14 that Jesus shall be named Emmanuel, Jesus was never called by that name. Again, in Isaiah 9:5 we read, “They name him Wonder-Counselor, God-Hero, Father-Forever, Prince of Peace.” These including “Emmanuel” were given not as literal names but as the title that specifies the nature of the Messiah. (24) When Joseph awoke, he did as the angel of the Lord had commanded him and took his wife into his home. Unlike Zechariah or Mary, Joseph did not ask any clarification to the angel. Dream is not in our control. 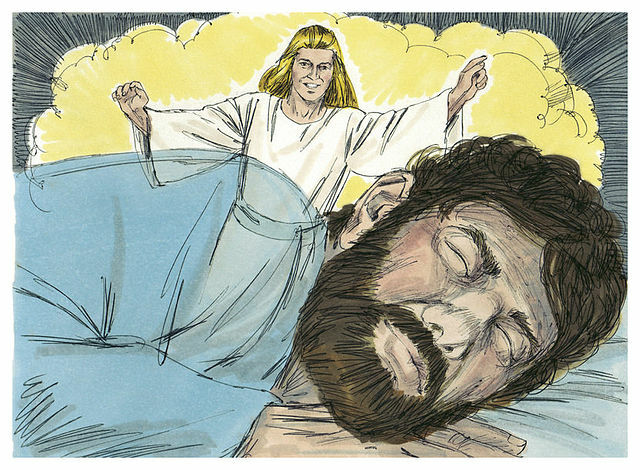 Joseph believed in this dream because he was convinced that it was unlike a regular dream. He was happy that he received this clarity from God and gladly accepted Mary and the child. Joseph legally married Mary by taking her to his home as the Angel of the Lord had commanded and their marriage was not consummated. Joseph became the father of Jesus not by adoption but by his marriage to Mary, the mother of Jesus. But unlike other stepsons, Jesus had no human father. That made Joseph’s relationship with Jesus more intimate. Besides, Joseph knew that he was protecting and nurturing the God incarnate who created him and had been protecting him. 1. Like Joseph who was non-judgmental in his approach towards Mary, let us also not jump to judge others or act against them. Even if we cannot comprehend the view of others, let us try to understand them from their position or leave it to the judgement of God. 2. Joseph was patient in resolving the issue with Mary. Though Joseph was considering a private divorce, he took time pondering on it. An immediate reaction from Joseph could have made Mary’s life miserable, and missed his vocation as foster father of the Messiah. Timely action is good in emergency situations. However, when there is a conflict within oneself or in the relationship with others, patience and tolerance for a while with trust in God will help us for a better solution. Reasonable buying of time can be beneficial to get help from God or from others to resolve the issues. 3. Like Joseph, let us also cooperate with the will of God. He is a silent character in the Bible. We do not hear him speak. He did not say a word to the angel, probably because the angel spoke to him in a dream. When Jesus was lost and found at the age of 12 in the Temple, Joseph did not say a word. It was Mary who spoke to Jesus. Though Joseph did not express his willingness to cooperate like Mary did, he wholeheartedly took up all the responsibilities of his mission. He was not honored as the foster father of the Savior while he was alive because Jesus had not become popular before Joseph’s death. The only honor Joseph had was that he died at the presence of his legal son and Messiah Jesus, and his wife and co-redeemer Mary. As the disciples of Jesus, we are called to cooperate with Jesus and do the will of God in our lives. More than our words, our attitude, humble service, and willingness to take up the hardships of life for the family and for the church are important.